Alert the media, Mr. President has received a personal twitter account! There already is an official presidential twitter account, but Obama rarely has a hand in that. This one, @POTUS, is exclusively his. Be sure to follow the president, he surely will have some very interesting things to say. This past Wednesday marked the end of an era; David Letterman did his final talk show after 33 years on the job. For weeks before, every guest Dave had on the show thanked him in some elaborate way, whether it was an emotional speech or a funny tribute. 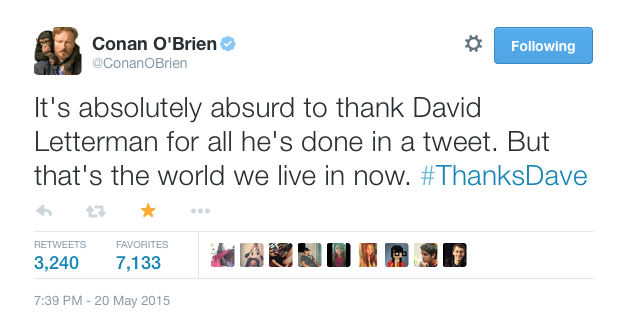 A lot of celebrities and friends of Dave took to twitter this week to thank and honor him, including Conan O’Brien and Ryan Reynolds. Be sure to see Dave’s last show; it was over an hour and a half long, had many montages, music from the Foo Fighters, and even Dave’s wife and son were in the audience. It was very emotional and special; definitely worth checking out. 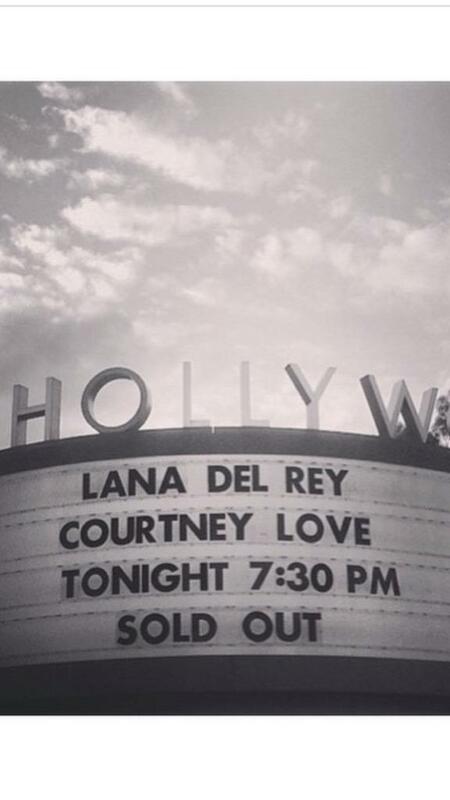 Lana Del Rey is currently in the middle of her Endless Summer tour, and recently performed at the Hollywood Bowl in Los Angeles; it was completely sold out, and Lana tweeted this picture in celebration. Many A-listers attended, including Miley Cyrus and Kendall Jenner. The tour has been a success so far (with a minor hiccup when weather cancelled a show in Dallas). Lana has been performing unreleased songs, much to many fans’ delight. Also, in programs being sold at the concert, fans have discovered the lyrics to her new song “Honeymoon,” the title track of her upcoming album. The lyrics are very beautifully written and everyone is now more impatient than ever for the record to drop. While no official release date has been announced, August seems to be the month to expect it. 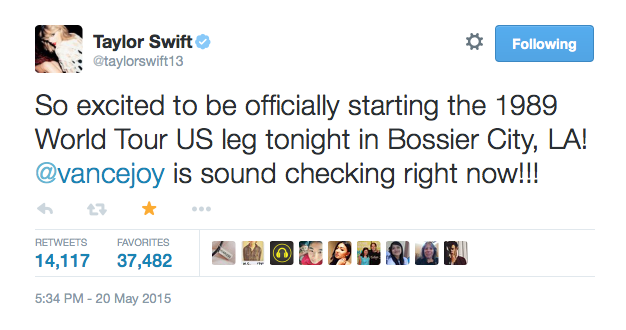 Another successful tour right now is Taylor Swift’s 1989 world tour. She is now performing in the US. Right now Taylor is having a great month; she won multiple Billboard awards and her “Bad Blood” music video premiered on Sunday, breaking records for the most views on Youtube in the shortest amount of time. Also factoring in her new boyfriend Calvin Harris, who she seems to like very much, Taylor is doing extremely well. We can’t wait to see what she does next! Are you going to catch either Taylor or Lana on tour? 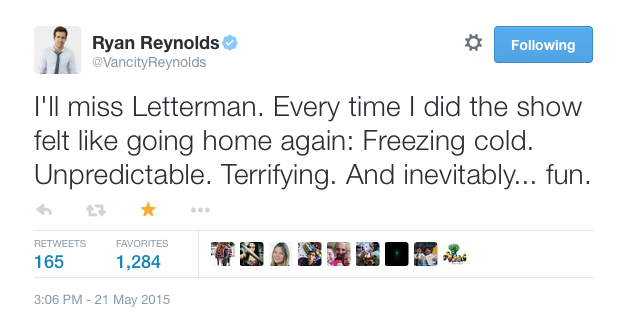 And what did you think of Letterman’s last show? Let us know in the comments or tweet us using #glamorouspaper!